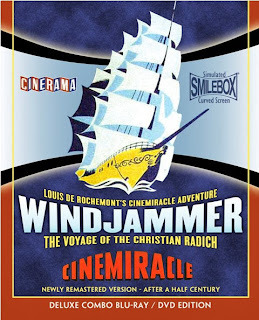 Shot in Cinemiracle a competitor to Cinerama WINDJAMMER tells the story of training ship full of teens as they leave Oslo Norway and sail the Atlantic making stops at Madeira , Curacao, Trinidad and New York among other ports before heading home after 9 months. I released by Flicker Alley as DVD Bluray combo pack I picked up the disc because I could get it on sale with THIS IS CINERAMA. The purchase was an after thought and not really a carefully considered one. This turned out to be one of those moments where I discovered something truly special. Nominally a documentary, though owing to the fact that shooting with the three camera rig doesn't allow for shooting from the hip most of it has been staged (There are musical numbers and the scenes in the coal room are completely fictitious) . This doesn't mean that what we are seeing isn't happening, rather it means that what we are seeing simply involves just setting things up and letting them go. Full of sequences that take your breath away on a big TV I can only imagine what this looks like when projected in a Cinerama screen. Its one of those times where you keep muttering "oh wow" or "Oh cool" with regularity. Almost all of the sailing sequences are fantastic, the basket rides are really cool as are the sequences late in the film involving the US navy. Watching the missiles fire, the sub surface and scuba diver swim is just amazing. This is one of those films that really takes you and puts you into some place you really can't get to. To be honest seeing the film I completely unerstand why Cinerama bought out Cinemiracle and released this film themselves. I also understand why the film played for six years in theaters its that spectacular. The home video set is amazing. Containing not only a restoration demonstration which will impress you with what can be done these days, the film also has the breakdown reel (it was to be used if something happened to one of the 3 projectors) which contains roughly 15 minutes of additional footage and a making of which tells you how it all came together and what it was like making the movie. You'll forgive me for not really critiquing the film, I don't think that's possible since the film is not so much the story but the power of the sound and image. As an experience its simply over powering. This is way cool.